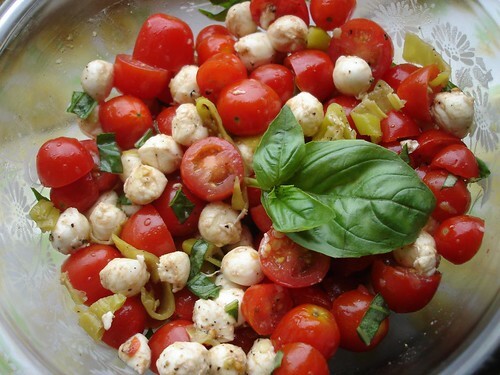 Posted byMandy	 September 22, 2008 2 Comments on Basil, tomato, and mozzarella salad. It has been a very long time since I had time to post. But, I am hanging out today to tell you all about the grape tomato, basil, and mozzarella salad that I made a while back. It is pretty easy to make. First, wash your basil and tomatoes well. Veggie wash is what I use. Next, halve the tomatoes and cut up the basil. I find that using kitchen shears to be the easiest way to chop herbs. If you have some pepperoncini peppers lingering in the fridge, you can also seed them and chop them up to throw in the mix. Finally, add the mozzarella balls, giving everything a good stir. I generously sprinkled the mix with sea salt, pepper, and garlic powder. Then I drizzled the oil and vinegar over everything. After stirring the salad well, I covered it with plastic wrap and let it marinate for at least two hours. This was good on the first night, but it was even better the next day as all of the flavors melded together. I hope you enjoy the salad and again, I am sorry it took me so long to post anything. I have been very busy as of late. But, I promise, the next time we meet I will be talking about Cajun blackened “chicken” that is made using Quorn. Until then, have a great day and keep cooking! hey hey- that looks delish. i am so looking forward to the cajun “chicken”. i love that quorn stuff. travis & i are having the ones with Gruyere tonight. yum!